Ravenclaw! Although Adam does exhibit the courage and chivalry of Gryffindors, his personality is definitely more intelligent and clever like that of Ravenclaw. We went for a second visit of the Harry Potter Exhibition at the Museum of Science over the weekend. As soon we entered the store, I whipped out my camera and took pictures of "Diagon Alley" and many of the items in it. Near the end, I was taking pictures of the jewelry, when a cashier said that photography wasn't allowed. "It's still part of the exhibit." P.S. Back to Blogger comments for now as Haloscan is finally meeting its demise. He looks very excited to have it on! Awesome! That picture is priceless! At least you got a chance to get some good pics. I look forward to seeing more of your pictures. Awww cute! We love Harry Potter in our home and that hat would be so awesome to try on! I've done that before where I took pictures only later to find out that I wasn't supposed to. I would never do it on purpose but am usually glad I didn't know the rules. That picture is super cute. Wow a Harry Potter replica. Glad you managed to get some shots, before being shut down. Great Pic. How cool! Wonder if that exhibit will be making its way to our science museum? That's just awesome! We love harry potter. So cute! Visiting from 7 clown circus- wordful wednesday. What a great exhibit. I didn't know they had this at the Museum of Science at the moment. what a freakin' cute picture...AND a cool hat!! That's so cute! Sounds like it was a fun exhibit. I love to see Adam standing under the sorting hat, cute!! 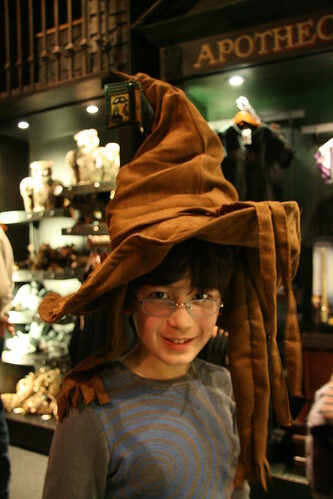 The hat is a little too small for Adam, It was dangling on top of Adam's big head Dose he like to be in Ravenclaw? May be Gryffindors? or creat a new one for Adam, something like Ravendore to match his personality. Glad you got some photos, that would have been so hard not to take any. Sounds like it was a blast! he looks a lot like Harry Potter!!! What a bummer about no pictures! I'd been looking forward to your post about the exhibit! !